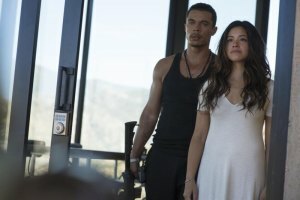 Gloria (Gina Rodriguez) has incredibly bad and good luck. She visiting her gal pal in Tijuana Mexico when the Millennium nightspot turns into a planned random act of violence. Gloria escapes unscathed but can't find Suzu (Cristina Rodlo), who planned to compete in the Miss Baja beauty pageant. Unfortunately, Gloria runs to the police for help. They're tied in with one of many gangs and she's turned over to lord Lino (Ismael Cruz Cordova, "Ray Donovan") who's survival depends on her U.S. visa. Ordered to make a delivery, she completes the task only to be nabbed by Matt Lauria playing an incompetent DEA agent. Directed by Catherine (Thirteen) Hardwick she propels Rodriguez (Jane the Virgin, Annihilation) from Hollywood makeup artist to unwilling drug mule quickly caught into intertwining corruption between bad guys and good guys. A little sanguine initially ( watch her high heel sandal escape from a convention rest room) , Lino takes a liking to her both in the "take off your clothes" and "you've gotta learn to use an AK." Determined to find Suzu repeatedly draws her deeper into the quickening sand. Obviously, Hardwick aspires to Gloria as an action hero since the filmmakers have remade the 2011 Spanish language original under Geraldo Naranjo's direction toned PG-13 for luring teen gal's on an empowerment theme. Unlike Howard, Rodriguez moral temperature bursts , and, soon,, she's astutely passing info all around and having gained a perfect aim in her 30 second how to use an AK session. Anthony (Nate Ruffiin, We Are Marshall; Marvel's The Falcon) Mackie turns up as another gray side agency recruiter. Action, action, action juts through "Bala," but the duck, dodge and shoot first time skills stretch "luck," but Rodriguez has a face for which smiles brighten beauty; she's best freezing into a chiselled stare and quickly thinking out an on the spot escape.through athleticism and wits, not super powers. Otherwise, we've seen the bursting of bullets (in Spanish, Bala=bullet) in luxurious settings previously, just not where the latina crams takes down gang members like a Stallone, Eastwood or Norris.